As superintendent of Pennsylvania's Central York School District, Michael Snell is spearheading an effort to tailor the student experience through mass customized learning and an "ecosystem" that combines technology and in-person interaction while moving away from seat time as a measure of accomplishment. The district is 1-to-1 in grades 4–12 and gives students control over their own learning with the help of online curriculum from Odysseyware. 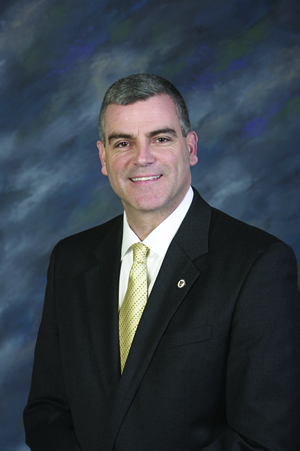 Michael Snell, superintendent of Central York School District. THE Journal: What sparked you to move in this direction? Michael Snell: A few years ago I read the book Inevitable: Mass Customized Learning by Chuck Schwahn and Bea McGarvey, then had our team read it as well. The mass customized learning movement is focused on what is the ideal classroom given the fact that everybody learns at a different rate, has different learning styles, and yet this industrial-based model we've found ourselves in for the last 100-plus years is anything but what we know about how kids learn. So reading that book started the process of realizing there are some really good things in the industrial-based model, but balancing that with what we call the road less traveled, which leads us to our ecosystem — what we see as the ideal environment for learners. THE Journal: What did you decide was worth keeping from the traditional approach to education? Michael Snell: We can talk about technology and providing the sum of all human knowledge in a device, yet the human element must never go away. Often when a district moves to incorporate more technology there is a reaction that we're not going to need teachers in the future, and we categorically reject that notion. Mass-customized learning is about voice and choice. There are some kids who learn better through standard industrial-based delivery, if you will, and there are other kids who do better at projects. And wouldn't it be great to give kids some choice in how they best learn, rather than just focusing on how one best teaches? Everybody in the world customizes for you; public education has to begin to customize as well. THE Journal: How are you using technology to drive the curriculum in a new direction? Michael Snell: We're working very hard with learning management systems and other technology that will enable a parent to determine at a moment's notice exactly where their child is in this 13-year progression from kindergarten to 12th grade. If you think about a high school student working at his or her own pace, why should that learner sit in algebra for 90 days when you can do it in 45? And so we really believe that once you put this 13-year progression into a map with some sort of technological component, you can be totally transparent and move forward from a curriculum perspective. We often say that if parents can GPS their children through their cell phone at any given corner in America, they should know where their child is in this 13-year progression at any given moment. We think that a small, affordable device and Internet access is the game changer. And when you can provide the sum of all human knowledge on such a device, we have to come to school every day and ask, what's our role now? Are we teachers or are we learning facilitators, and how do we help them manage this information? So we believe that we need to partner with parents by providing devices and helping them create this world of technology that is their children's future. THE Journal: You refer to students as learners and teachers as learning facilitators. How does that represent a philosophical change? Michael Snell: When we talk about a student, there is a sense of passively sitting in a nice, neat row, whereas learners are engaged and get up and move and use not only the classroom but our new, transformed library that enables them to communicate and collaborate and home. The idea is that you're not just a student during the day; you learn 24/7. And from the teachers' perspective, it's less about standing all day, lecturing, giving a worksheet, then having the student cramming for a test on Friday before forgetting it and moving on. It's about facilitating the process in which the learner has some voice and choices, some ownership, and does great work for real-world audiences. THE Journal: How has the nature of students' work changed in the new environment? Michael Snell: We're in a conversation regarding what are those things our learners should be working on. We have several student-run businesses at the high school so it's going beyond putting a poster board together, but it's also about real-world work. From the technology end we have an 'I' team; we have kids who help us maintain all of our devices; we have students who write apps. We talk about the four Cs of 21st century education, but we have a fifth C, which is caring, and we donate profits from these student-run businesses to charities such as Panther Pantry, which is for kids who run short on lunch money. There will always be standards, but our goal is to increase the amount of voice and choice that they have regarding content and how they best learn to demonstrate the mastery of the standards. How do you really create a good piece of learner work — one that prepares that learner for the future, which is really the goal more than the standardized test. THE Journal: What evidence have you seen, anecdotal or otherwise, of the success of what you've done? Michael Snell: I have been very careful to say that whether a kid has a device or not, or whether we're mass-customizing the learning environment, I am not so sure that it will translate into improvements in standardized test scores. We certainly want to do well in that area, but we're preparing our students for the future and not necessarily for rounds of standardized tests. We are gathering data, surveying our learners and parents after every year regarding their experience with school. And we can say without a doubt that when learners have some say in how they learn, that increases engagement and increases learning — and not just the kind of learning where you memorize for the test and move on. Plan: Bringing mass customized learning (MCL) to life in your school district requires a vision and thorough review of the ways of doing our business of education. If your district is interested in implementing a customized learning approach, take time to review current comprehensive plans to determine what you need to make MCL a reality. Will you need facilities changes? Additional staff? Technology resources? Taking time to ask yourselves questions and map out a plan BEFORE you start to act will help you anticipate potential challenges and proactively address them before implementation. Pilot: Piloting a new program or initiative is a great way to test your plan and evaluate what is working, and what needs to be revisited, before expanding to a full-scale, district-wide implementation. Piloting MCL in a few classrooms or schools will enable you to observe your plan in action and determine next steps before taking your program district-wide. Communicate: As much as possible, make sure your school board, leadership team, faculty and staff, community members, parents and learners are engaged in conversations from inception to implementation. Be proactive in sharing information about any potential programs or initiatives that you are considering, and ask for feedback early and often from your stakeholders. This will help you build support for your efforts and also highlight any areas for improvement as your communications and work continue.